Here we go again, Fishing in the Discount Bin. Watchin' movies and blogging about them, because we all need hobbies. This time, doing the Disney animated classic The Adventures of Ichabod and Mr. Toad. This is originally in my notes at November 4, 2018. Well, Halloween has come and gone, and this past Halloween I was thinking, "Do you know what was on TV every Halloween when I was a kid, but I haven't seen in ages? Disney's animated Sleep Hollow." A couple of mouse clicks later, and I'd bought it on Amazon. Gotta make that Prime membership pay for itself! I don't think I'd ever seen it in its original theatrical exhibition, as part of the animated film The Adventures of Ichabod and Mr. Toad. I tend to get my Amazon purchases delivered to work, because that's where I am whenever the courier comes around. As such, I tend to force my co-workers to watch the unboxing. As I was skipping around the office, showing off my purchases, one co-worker asked, "So why is it called The Adventures of Ichabod and Mr. Toad? Is Mr. Toad the name of his horse?" And questions like that make me launch into Leonard Maltin mode. Disney's animated film unit was just getting off the ground when World War II broke out. As such, Disney found a lot of their resources being diverted to the war effort, be it animators getting drafted, or the remains of the animation department putting their resources on making training and propaganda films. In order to keep the feature film unit alive, Walt Disney came up with the concept of "package films." These animated features were several animated shorts released as a compilation. We know such projects as anthology films today. Most of these shorts were eventually released individually, and in fact, a lot of well-known Disney animated shorts came out of the package films. Mickey and the Beanstalk comes from Fun and Fancy Free, Peter and the Wolf comes from Make Mine Music, and a personal favourite, Johnny Appleseed, comes from Melody Time. 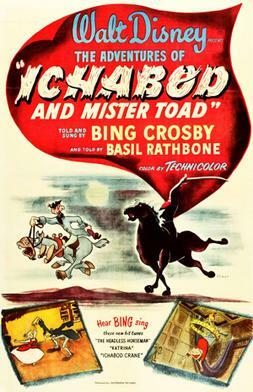 The final of these package films was The Adventures of Ichabod and Mr. Toad, released in 1949. And then, in 1950, Disney returned to full-length feature films with Cinderella. . So, The Adventures of Ichabod and Mr. Toad is actually two, half-hour long shorts. The first one is an adaptation of The Wind in the Willows, and this is where we get Mr. Toad. The beloved classic children's novel becomes quite the slapsticky adventure in the hands of Disney animators. Our hero is Mr. Toad of Toad Hall, some classic old money. His kind heart and fast-spending ways means he usually gets himself in quite a bit of trouble, both personally and financially. Fortunately, he's got his friends Rat, Mole, and Badger to help reign him in. Or, as Disney re-named them, Rat, Moley, and McBadger. The main plot is Mr. Toad becoming infatuated with this new invention called the motorcar, and he years to have one to go for a rip. Sadly, his mania gets the better of him, and he soon finds himself on trial for stealing a car. Rat, Moley, and McBadger soon learn that it was all a scam to swindle Toad out of his fortune and Toad Hall, and we're soon on a madcap chase to save Toad. All I can say is it's strange seeing such a manic interpretation of The Wind in the Willows. I mean, my main exposure to The Wind in the Willows is the incredibly mellow stop-motion animated series out of the UK from the late-1980s. YTV showed it a lot in the early 90s, and it was one of those things I'd sleep through while waiting for Ninja Turtles. So you can see, it was quite the jarring contrast. And showing that Disney's love of celebrity voices goes back their early days, The Wind in the Willows was narrated by Basil Rathbone, who, at this point in cinematic history, was defining Sherlock Holmes on the big screen. But then we get to our second segment, The Legend of Sleepy Hollow, which was narrated by Bing Crosby. Telling a friend about my purchase, he was telling me that, thanks to this, he forever associates Bing Crosby with Halloween and Boris Karloff with Christmas, when for most, it's the other way around. For those who need the explanation, Bing Crosby's biggest hit was White Christmas, and Boris Karloff was one of cinema's first horror stars, having played Frankenstein's monster and the Mummy in the classic Universal horror films. And later in his career, Karloff was the narrator of the classic Christmas special, the animated adaptation of How the Grinch Stole Christmas. Anyway, I'm sure we're all familiar with the tale. In the early days of American independence, in the small New York town of Sleepy Hollow, a new schoolmaster comes to town by the name of Ichabod Crane. He's a gangling and awkward sort, which soon makes him a target of the town's good ol' boy Brom Bones. The way Brom Bones is portrayed, he could quite easily be a distant cousin of Gaston's, but not quite as malicious. Despite his awkward mannerisms, Ichabod Crane soon proves himself to be utterly charming and a smooth talker, making him the town's ladies' man. And it's not long before Crane and Bones are competing for the hand of Katrina van Tassel, the wealthy daughter of the local land baron. Things come to a head at the social event of the season...the van Tassel's Halloween ball. it appears as though Crane has all but secured that heart of Katrina, when Bones hatches his plot. Knowing that Crane is a superstitious sort, Bones entertains the crowd with his tale of the Headless Horseman that roams the woods, looking for a head to replace his own. This tale scares Crane out of his mind, and on his moonlit ride home, he begins imagining various ghosts and goblins in the woods...until the very real Headless Horseman shows up, leading into the very memorable chase scene that caps the tale. Was Ichabod Crane spirited away by the Headless Horseman, or was the Horseman Bones in disguise, running Crane out of town? The world may never know, but it sure makes for one hell of an entertaining chase scene, which still holds up to this very day. For it's life outside this film, Disney's animated version of Sleepy Hollow became a mainstay of many a Halloween episode of The Wonderful World of Disney, and Disney-produced Halloween specials. It doesn't get much airtime anymore, mainly because something so frightening doesn't mesh with Disney's carefully cultivated family-friendly image anymore. All I know is its still as thrilling as the first time I saw it when I was a kid. Great stuff. Here we go again on Fishing in the Discount Bin. I watch a movie and blog about it. You know the drill by now. 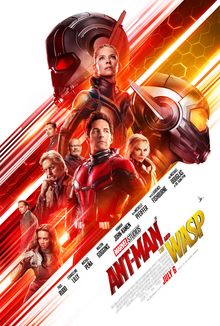 Today, I'm doing Ant-Man and the Wasp. This is originally in my notes at November 1, 2018. Here we go again on Fishing in the Discount Bin. I watch a movie, I blog about it. Just like that. 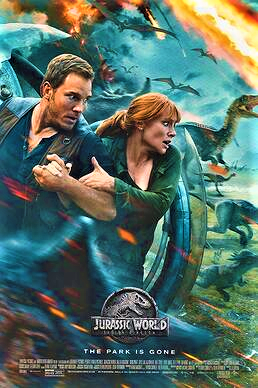 Today, I'm watching Jurassic World: Fallen Kingdom. This is originally in my notes at September 30, 2018. Once again, I am blogging my annual Christmas card letter, for those who have drifted away from me, wondering whatever happened to me, and googling my name some night. Mark Cappis here, with another holiday form letter about how my 2018 was. Things are still pretty much static for me. I’m still up in Westlock, still pluggin’ away in the newsroom of Real Country 97.9. If you read the financial pages, then you’ll know that we were bought out by a company called Stingray a month or so ago. It hasn’t led to any big changes for those of us in the small markets yet, so it’s still the same great station. The key word for me in 2018 was “health.” Back in the spring, I finally caved to my mother’s wishes and got a full medical check-up. The doctor’s exact words were that I’m in the “grey zone” for diabetes. High blood sugar and a history in the family put me at a high risk for developing it. So, I’ve been keeping a closer watch on what I eat and getting out and exercising more. At my last follow up, doctor says I’m down 14 pounds, which is good. I’ve got no real weight loss goals, but it’d be nice to fit into an XL T-shirt again. And that’s all I really have to say, that you probably haven’t read already across the social media platforms. Hey, I’ve been blogging since before the word “blogging” entered the lexicon, so a quick Google search can always catch up on what’s new with me. I really don’t know how to end this letter this year. Normally, I’d do it by mentioning how I’m counting down the minutes to the next Star Wars movie, but this year’s Star Wars movie came out back in May. (And I really dug Solo: A Star Wars Story for what it’s worth.) So...how about that Aquaman? Aquaman sure looks good. Yeah. Just not the same.